East Liberty has over the past decade become a mecca for new restaurants. Over the last few years the neighborhood has also seen the opening of several innovative, healthy eating, fast casual restaurants. One of which is Honeygrow. Honeygrow features salads, noodle bowls, and cold pressed juice beverages. I set out to try Honeygrow with my intrepid, nutrition-conscious sister Melinda. Upon entering the bright, clean restaurant we looked at the big menu sign board and perused the possibilities. After deciding we stepped over to the electronic ordering kiosks to place our order. The electronic screens guide you through the order and payment process. One can order their selection as described or easily create their own custom item.. After the order is entered, payment options are credit card or cash. For cash you then go to the nearby cashier station where an employee completes the transaction. We had decided to share the white bean tuna Salad, red coconut curry stir-fry bowl, and a piece of focaccia bread. The stir-frys are prepared at an Asian wok cooking station with several units in a line. There’s also a salad making station at the counter in the open kitchen. I started with the white bean tuna salad which was a sumptuous mound of beautiful greens (a mix of organic arugula and romaine), small chunks of flaked yellow fin tuna (similar to that of canned tuna), hard boiled-egg, cuts of crispy bacon, herbed white beans, grape tomatoes, pickled peppers, and red onion tossed in a red wine Dijon-vinaigrette. The salad was a savory combination of ingredients, to which the light, fresh vinaigrette imparted good flavor without being overpowering. The menu lists the calorie counts for all selections and if they’re gluten-free or vegan.The white bean tuna salad was tallied at 480 calories and was gluten-free. The featured salads were all between 480 and 900 calories. Calorie counts can go higher or lower based on customization. 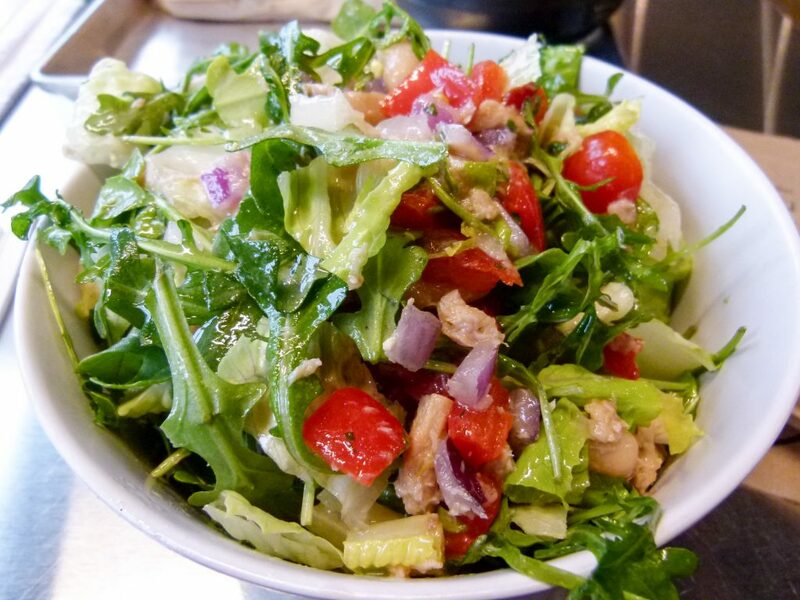 The menu offers four mainstay salads plus one seasonal offering. Walnut St. noodle salad (the chain started in Philadelphia, PA, so it refers to that Walnut Street and not ours in nearby Shadyside), Cobb, and Make It Grain are the featured salads and the seasonal when we visited was the spiralized beet caesar (now its Soulfull Oats Salad: organic baby arugula, roasted shaved local Brussels sprouts, roasted local sweet potato spirals, dried cherries, ricotta salata cheese, house made multi-seed crackers (made w/ Soulfull Oats), and a pomegranate vinaigrette). We then switched bowls and I tried the red coconut curry stir-fry. all the disparate ingredients—rice noodles, roasted spicy tofu (non-gmo), pineapples, jalapenos, bean sprouts, scallions, and cilantro leaves—all played well together. The stir-fry was a mix of sweet and spicy which delighted the taste buds, while the healthiness factor pleased the mind. The dish came in at a very reasonable 590 calories and was listed as both gluten-free and vegan. Most stir-frys range between 590 and 800, with higher and lower totals possible through customization. Melinda reported that she enjoyed the salad and stir-fry. We also split a piece of nondescript focaccia bread. While we were eating a member of the staff stopped by to check on us and other customers to see how everything was. A very nice touch indeed. The staff was friendly and efficient. 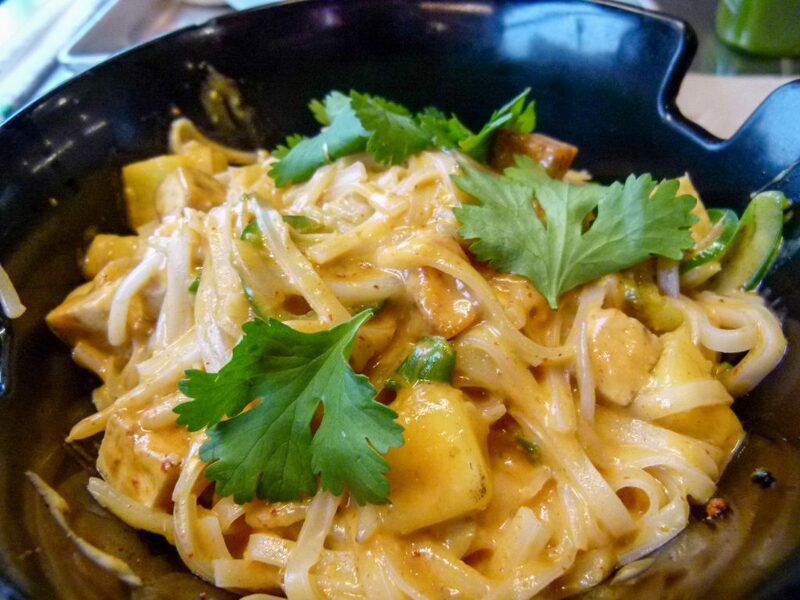 The four mainstay stir-frys are: spicy garlic, sesame garlic, sweet soy five spice, and red coconut curry. At the time we ate there, right after Christmas, the seasonal offering was Philly Roast Pork (now it’s vegan: spiralized sweet potato and zucchini ‘noodles,’ house made (w/ local tofu) vegan ‘chorizo,’ roasted spicy tofu (non-GMO), mushroooms, local kale, red onions, bell peppers, cilantro, spiced agave cashews, smoked paprika-tomato sauce). On a followup visit I was intrigued by the Make It Grain salad and ordered it. 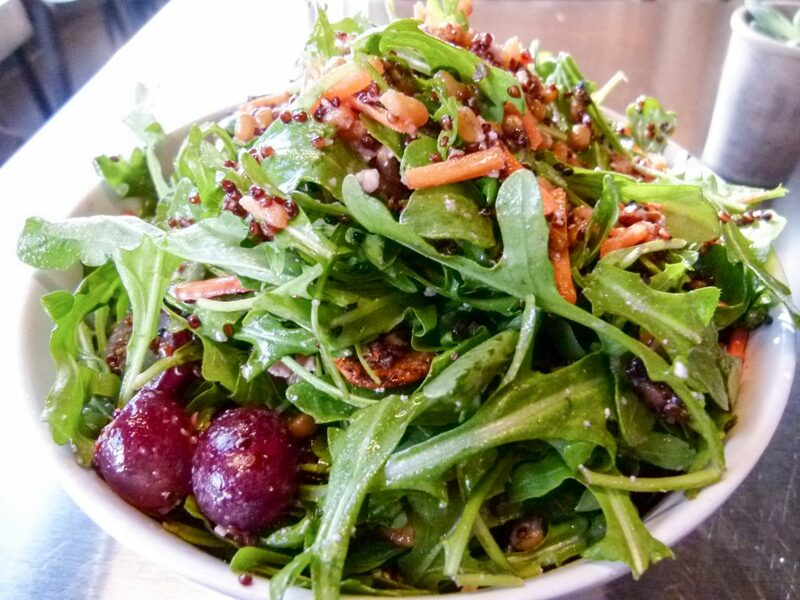 The salad is composed of wheat berries, red quinoa, organic arugula, grapes, roasted beets, carrots, feta cheese, spiced agave cashews, and tossed with a honey ginger vinaigrette. It was another splendid combination of ingredients. The grains and the cashews gave the salad a very nice textured crunch and taste, adding to its overall pleasantness. With a count of 640 it was a good value of flavor and calories. Honeygrow offers three different types (and colors) of cold pressed bottled juices ($6). I got a Green is Good bottle to go. The drink is light and flavorful with apple, spinach, cucumber, lemon, and basil. There is no added sugar but the natural sugars add up to 31 grams for the 12.6 fluid ounce bottle. Although the sugar level is high, calories amount to 130 per bottle. For a sweet treat Honeygrow offers Honeybars ($5.90). The bar is served in a cup with choice of three fruits (strawberries, blueberries, pineapples, apples, bananas, seasonal fruits), choice of wildflower, buckwheat or clover honey or maple syrup, and two toppings of your choice (coconut shavings, dark chocolate chips, granola). Local plain yogurt and house made whipped cream are optional extras. Honeygrow displays their sources for local ingredients in the store. 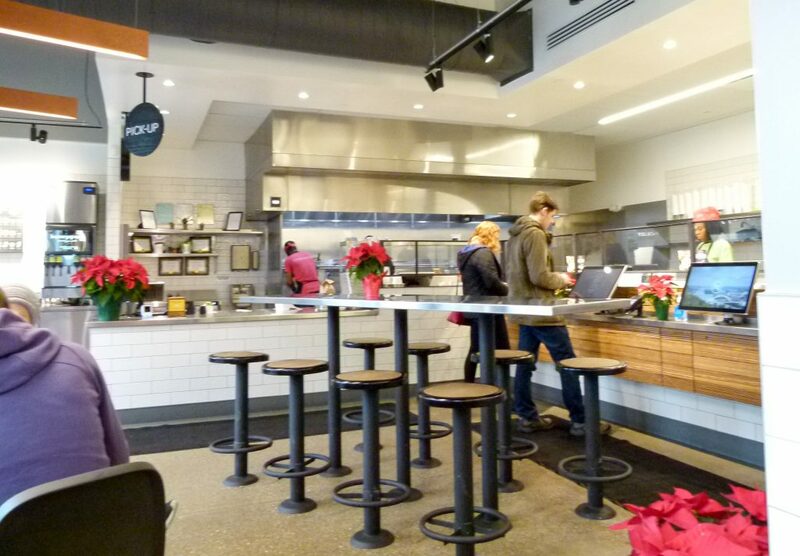 Honeygrow takes their sourcing of ingredients seriously and even has a sign in the store detailing what local farms supplied the local ingredients they use. 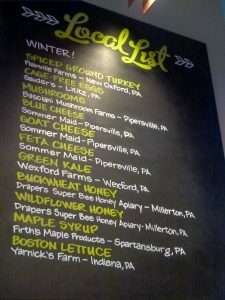 The also list a few local purveyors for cheese and other ingredients. All of the sauces are made in-house daily and they even brag that they have no freezers. When I first looked at Honeygrow’s menu online after their initial opening, I was concerned that their product offering was too narrow with just a limited number of salads and stir-frys. However, after eating there a couple times and enjoying the unique flavor profiles of their offerings, I don’t care about the limited number of selections quite as much now. They deliver a lot of flavor for a decent amount of calories. The prices are about what you would pay for salads and stir-frys with locally sourced ingredients in other establishments. Prices on our selections were: red coconut curry stir-fry ($9.55), white bean tuna salad ($11.30), Make It Grain salad ($9), and focaccia (.50). Featured salad prices range from $9 to $11.35, while stir-frys go from $8.95 to $11.05. Customization can cause prices to be higher or lower than normal. And as Melinda humorously pointed out, if you grow tired of healthier eating, The Milkshake Factory is right next door. Monday through Saturday: 10:30 a.m. – 10:00 p.m.